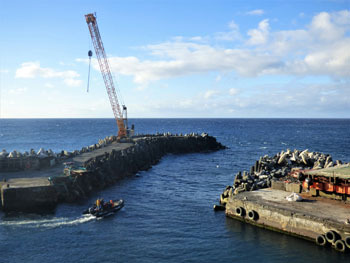 News of cruises, ships and yachts visiting Tristan da Cunha. 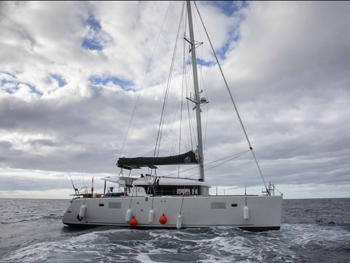 The Silver Cloud arrived at Tristan on Tuesday 19th March 2019. 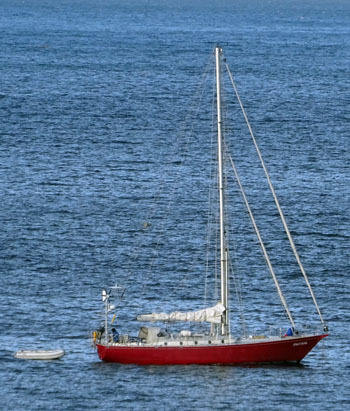 Because there was a bit of a breeze she had to make lee for the Zodiacs and so there was a bit of a slow start landing passengers. 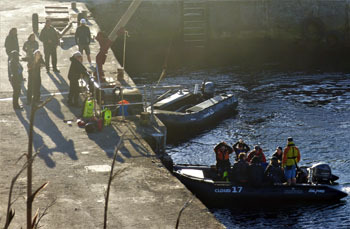 At 9:45am the first group were ashore and heading out on their tour of the Edinburgh Village. 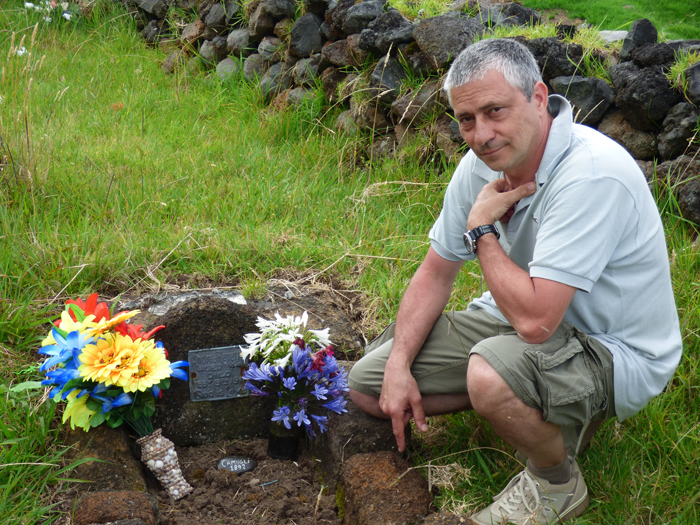 This was closely followed by tours of the 1961 Volcano, Potato Patches and Fishing Factory. 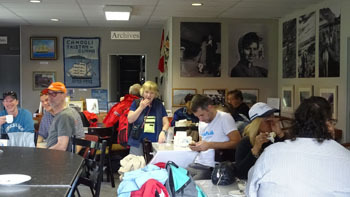 Souvenirs and Philatelic material were bought at the Post and Tourism Centre and the Tristan lobster sandwiches were very popular. This was washed down with a cup of tea or locally brewed beer, Albatross Ale. 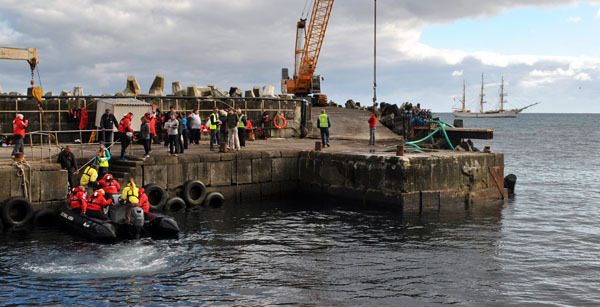 The guests also visited the Island Store and Prince Philip Hall stalls where local crafts were also on sale, stopping off at the Albatross Bar on their way. After boarding all her passengers that evening, the Silver Cloud headed off to the Outer Islands where she planned to make Zodiac tours. Administrator Sean Burns and Immigration Officers Paula Swain and Samantha Swain. 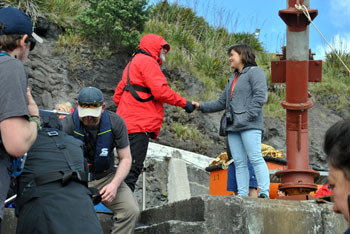 Head of Tourism Dawn Repetto welcomes visitors ashore. Silver Cloud guests start out on tours of the village. Close-up of the beautiful cruise ship from a Zodiac returning to Calshot Harbour around noon. 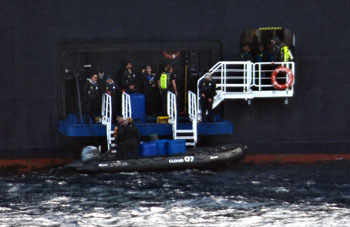 Zodiac returning passengers to the Silver Cloud. 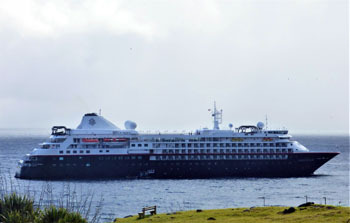 Silver Cloud takes last guests back on board and prepares to sail. 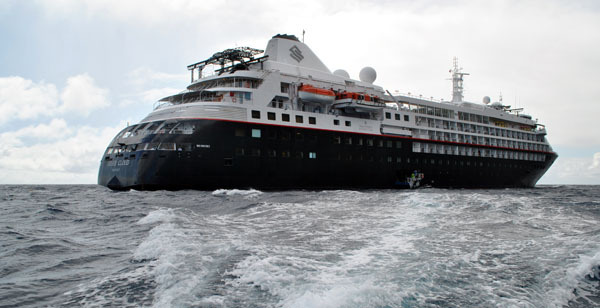 The above cruise is already advertised for 2020 and we wish the vessel many happy returns! 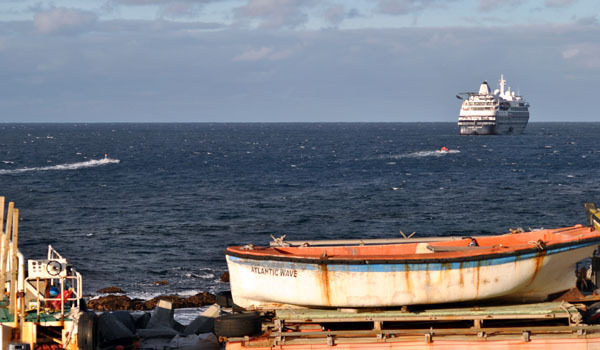 The Silver Cloud's visit is the final planned cruise ship visit to Tristan da Cunha for the 2018/19 season. If you were on the Silver Cloud, we'd appreciate your feedback using our Visitors' Feedback Form. 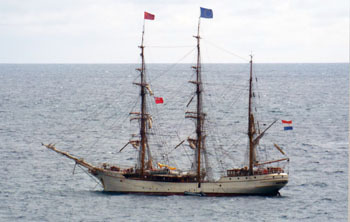 The Bark Europa has been a regular visitor to Tristan da Cunha since its inaugural voyage in April 2005. 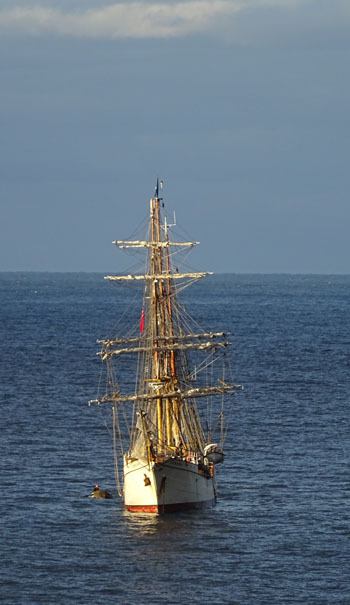 In 2019, the sailing vessel arrived for a two-day visit on Saturday 16th March. 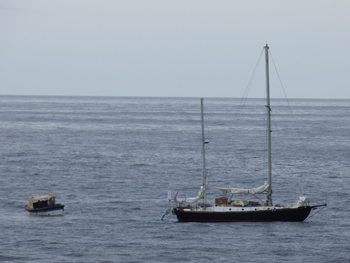 As the cruise ship Le Lyrial and the yacht Jonathan also arrived on this day, the harbour and village were busy. 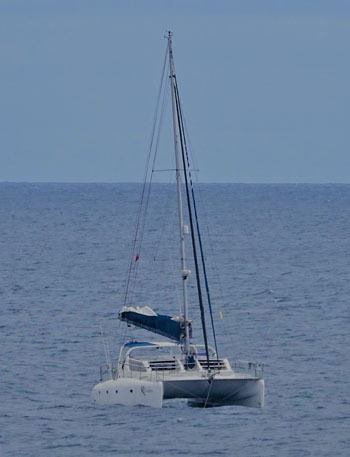 As Le Lyrial left for the outer islands, Bark Europa passengers came ashore for a second day on Sunday 17th March to enjoy the island. 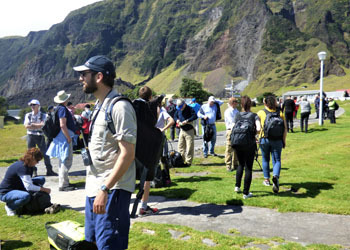 Bark Europa passengers were able to take part in guided tours around the Settlement of Edinburgh, the 1961 Volcano, the Potato Patches and the Bluff. 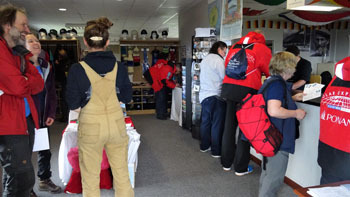 Visitors also partook in bird watching, golf and souvenir shopping at the 37o South Gift Shop, Island Store and Prince Philip Hall craft stalls. 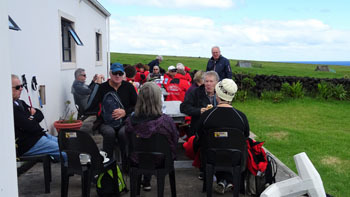 Refreshments were enjoyed at Cafe da Cunha, were post cards were written to friends and family over a cup of coffee. Being such a beautiful day after exploring they relaxed in the Post Office and Tourism garden. 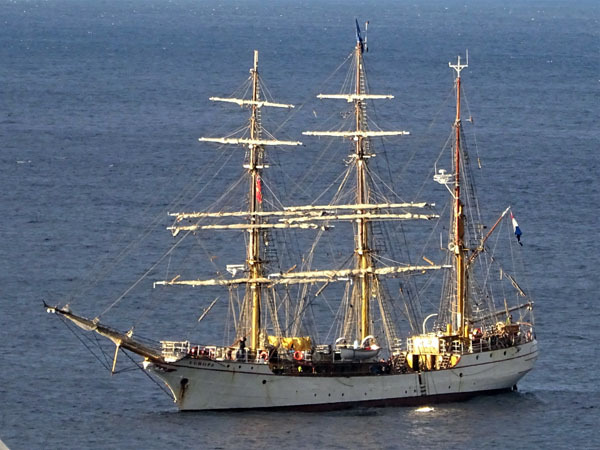 Bark Europa departed for Cape Town on Sunday evening and the community looks forward to another happy return in 2020. 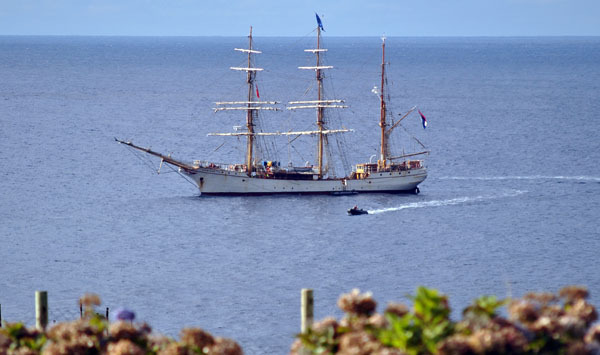 Left and below: More views of the stunning sailing vessel Bark Europa which has made visits since 2005. Post Office and Tourism Centre. 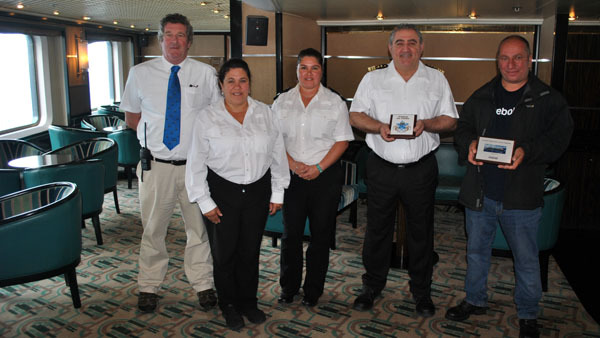 If you were on the Europa, we'd appreciate your feedback & suggestions using our Visitors' Feedback Form. Gianfranco Repetto is making an extended visit to the Tristan from Camogli, Italy, the ancestral home of the island's Repetto and Lavarello families.